The last issue of Marine Technology was published in January 2010. Members can still access papers and digital issues of past volumes through the "View Previous Volumes" link. The initial publication of (mt) was in April 2010. This quarterly publication publishes highly technical papers on applied research in hydrodynamics, propulsion, ship motions, structures, and vibrations. While the Journal of Ship Research requires that papers present the results of research that advances ship and ocean science and engineering, most contributions bear directly on other disciplines, such as civil and mechanical engineering, applied mathematics, and numerical analysis. High quality papers are contributed from the U.S., Canada and overseas, with representation from established authorities as well as new researchers. NEW! Online Only Member: Free! Original and Timely technical papers addressing problems of shipyard techniques and production of merchant and naval ships appear in this quarterly publication. Since its inception, the Journal of Ship Production and Design (formerly the Journal of Ship Production) has been a forum for peer-reviewed, professionally edited papers from academic and industry sources. As such, it has influenced the worldwide development of ship production engineering as a fully qualified professional discipline. The expanded scope seeks papers in additional areas, specifically ship design, including design for production, plus other marine technology topics, such as ship operations, shipping economic, and safety. 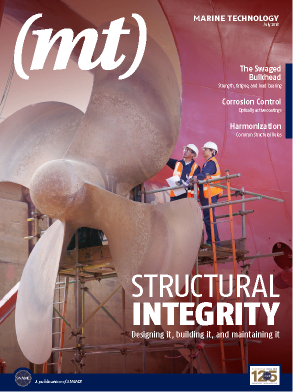 Each issue contains a well-rounded selection of technical papers relevant to marine professionals. Journal of Ship Production and Design is free online to all SNAME members. To access the journal, click on "View Previous Issues (Volume 26 to present)" and log in using your SNAME username and password. This important volume has been published annually since 1893. The Transactions provide a compilation of select papers presented before the Society during the calendar year and the Society's national award winning papers for that year. The contents are divided into sections containing archival papers of exceptional quality, primarily drawn from the Society's Annual Meeting papers, which include written discussions and authors closures; SNAME major award and prize winning papers; graduate and undergraduate student award winning papers; and significant papers of such high quality and intrinsic value as to warrant capturing them in the Transactions. The volume also includes a summary of the Society's business as reported at its Annual Meeting. Published by The Society of Naval Architects and Marine Engineers (SNAME) and SNAME's SC-2 Sailing Craft Panel, the Journal of Sailing Technology (ISSN 2475-370X) is an online peer-reviewed journal whose objective is to provide a medium for the publication of research achievements and engineering practices in this field. The current volume of Transactions is available for purchase in hardcover, softcover, and on CD. Please contact Our Content Department to inquire about previous year's volumes.